We want to thank Swinging With Purpose and their team for the donation of $25,000 to assist with our mission of rescue, rehabilitation and Safe Harbor Housing for minor, female trafficking victims. These young girls come with to us with complex trauma and overwhelming anxiety/fears. During the course of the program, they have "life-changing" experiences in advancing toward their goals in life, such as surviving through trauma, overcoming fear, and becoming leaders for others who are going through similar challenges in their lives. Learning new behaviors and learning that they are "worthwhile" and "deserve to be treated well and loved" and "that they now have hope for the future"
Extra Curricular activities - like, music, piano, dance, gymnastics, and many more choices. Thank you all so very much for changing the lives of these children. “When you change one life - - you change generations". Thank you for all your love and support over the years. Thank you for supporting our mission. WE are growing as the need in our community continues to grow as well. Through their love of golf, they raise funds to continue and further the mission of those organizations serving women in children in need. Their support will allow us to increase our efforts and we will now be feeding 300 children every week at Golden Gate Elementary! Cheryl Ollila, SWP Board member, and I have the honor of playing summer golf with the Burger/Brennan Summer Ladies Golf Group. This is an amazing group of ladies championed by Barbara Burger and Leona Brennan. At the end of our season, we chose a charity to support. This year, we selected Swinging With Purpose™. With the major destruction and devastation by Irma to those whom we serve, our hearts and checkbooks were opened and we collected our largest monies to date. 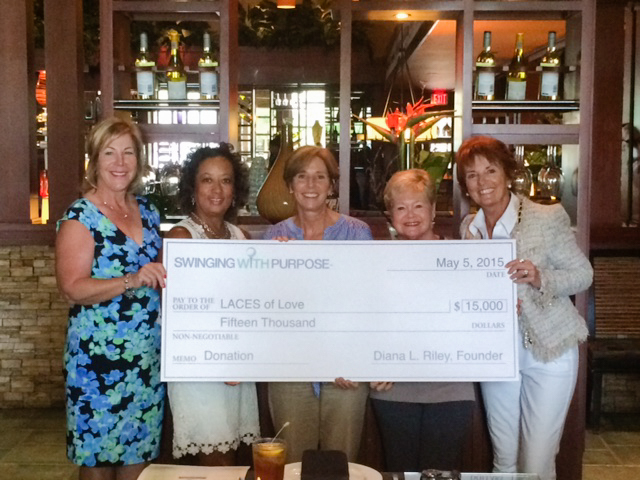 It was also decided that Swinging With Purpose™ would match the collection of $7,315. As a result, Swinging With Purpose will increase it’s 2017/18 school year donation to Blessings in a Backpack to $27,500 for the kids at Golden Gate Elementary School. With this increase in our support, WE will provide a weekend of non-perishables to 300 students. Summer Ladies, your generosity will directly address a growing HUNGER problem in our community. Summer Ladies, You ROCK! Thank you to all who participated in our Annual Swing Month and this year's Annual Golf Tournament at Kensington. It is because of your support Sunlight Home has a new roof! Cheryl Ollila (left) and Sandie Fleming (right) board members of Swinging With Purpose presenting executive director, Jean Takacs with their check of support. New deck and screening for the units in Providence House is on its way due to Swinging With Purpose and an anonymous donor! Thank you! PACE Center for Girls, Collier at Immokalee had a wonderful experience working with Diana Riley, Nancy Lopez and everyone from Swinging With Purpose™! It was truly an honor to be chosen as one of the charities to benefit from the golf tournament and pre-tournament activities. With the +$50,000 donation, our center started a health and fitness initiative. The resources we received funded a PE teacher and gave us the opportunity to offer PE for credit for the first time ever. It feels great to be part of the Swinging With Purpose™ community! Thanks to Swinging with Purpose, Dress for Success in Naples has been able to purchase racks to hang attire, shoes racks, as well purchasing badly needed large size clothing from sizes 20 – 26 and other clothing that is not available in our boutique. We have been able to network in the community to recruit for volunteer Personal Shoppers and Mentors and again thanks to Swinging with Purpose have had the opportunity to meet other non-profit organizations; such as the Shelter for Abused Women and Children. From the bottom of my heart and on behalf of the Dress for Success SW Florida, we graciously thank you! Laces of Love is able to purchase many new sneakers and socks for needy children in Collier county because of the Foundation: Swinging with a Purpose! 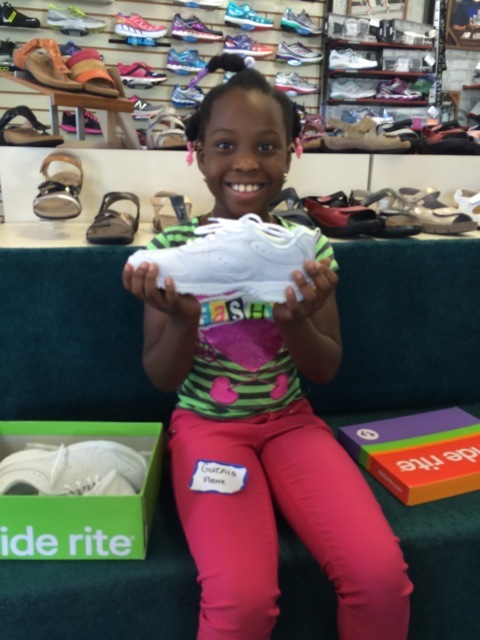 Over 276 needy children were fitted in new shoes! As I measured tiny little feet and many big middle school children’s feet as well, I saw the look of gratitude and excitement in many faces as they received a new pair of socks and new shoes. Some of these children were wearing shoes two sizes too small for their feet. Many did not have socks on their feet and their shoes were torn and full of holes. Without your help and the support of the Golf tournament, we would not be able to help these kids. We are so grateful for your organization and your concern for the children in our community. Diana, and your wonderful board have embraced our charity and we are so touched by your kindness. We have started our back to school shoe deliveries and we have been able to give more shoes out this year because of your help. Thank you again for your tremendous support for Laces of Love! Karen Watson, Executive Director, Our Mother's Home with multi-passenger van. Our Mother’s Home received $25,000.00 from Swinging with Purpose™ to help with the purchase of a 15 passenger van, used for transporting residents and their children. In December, 2015, SWP purchased a SUV for OMH, providing much needed reliable and spacious transportation. 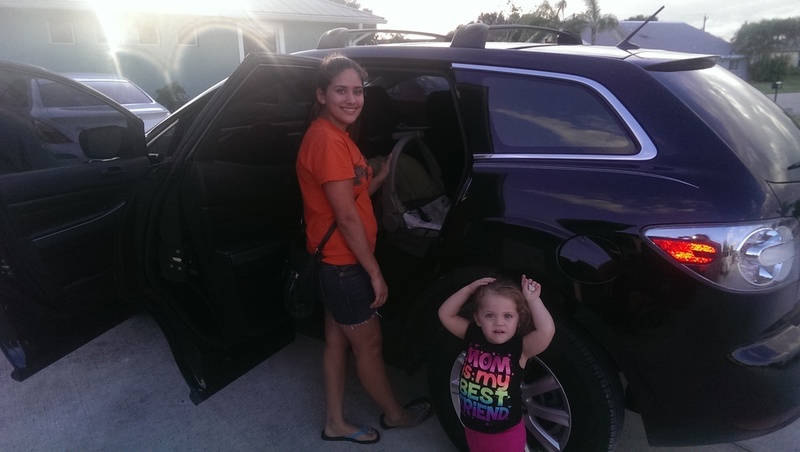 An SUV is the perfect vehicle when transporting a mom with her child for appointments, etc. There is a feeling of normalcy that does not come from being transported in a multi-passenger vehicle. Both purchases have made a big difference for OMH. We commend Swinging With Purpose™ on your efforts to meet the needs of Our Mother’s Home and the community. Thank you. This donation from Swinging With Purpose gave each women a sense of their dignity, helped them to regain trust in people and definitely gave them hope for a better future along their path to independence. To all the participants in this Swinging With Purpose event, I encourage you to continue to swing with purpose allowing this wonderful organization to keep moving fore-ward in their mission! Thank you from the bottom of our hearts for choosing Providence House! Thank you for taking the “H” in homeless and turning it into an “H” for “Hope” and “Homeless” no more! Sunlight Home received $23,000 from Swinging With Purpose to purchase a desperately needed 2015 Chevrolet 15-passenger van which we will use to transport all of our maternity and transitional housing residents and their children, in comfort and safety, to school, work and appointments. This beautiful new vehicle replaced our 1997 Chevrolet van that was on "life support" after many years of service. Without this generous donation from Swinging with Purpose, we would not have been able to provide such comfortable, reliable transportation for our mothers and their children. 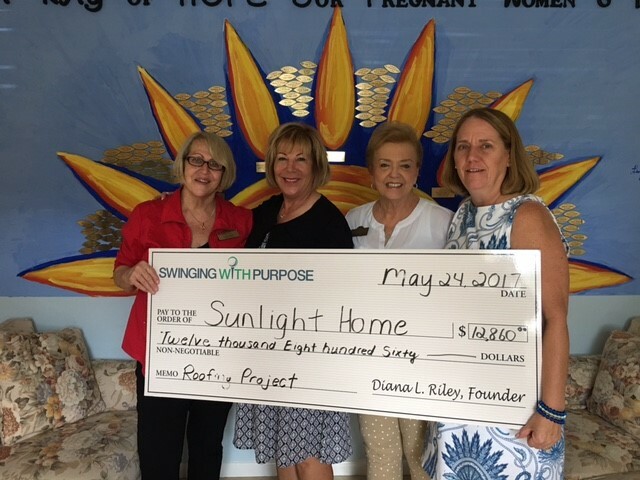 We are so grateful to the Swinging with Purpose Family and their support for our programs for homeless, "at risk" pregnant women and teens. Your compassion and kindness for our organization and others committed to making a difference in the lives of the women and children in our community is unsurpassed. Thank you from our mothers, children, staff and volunteers for choosing Sunlight Home as one of your beneficiaries.